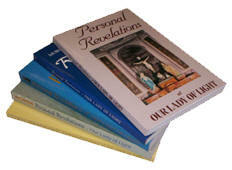 Complete five volume set of Personal Revelations of Our Lady of Light. From the beginning in a field in Indiana to the conclusion of public appearances in 2004, Our Lady leaves us with her words of guidance in seeking her Son. This set, gift wrapped in gold ribbon, makes a great addition to any library. See descriptions of each book below.